Many a band has been chewed up and spit out by the beast that is the major label music industry, but few survive the experience in as spectacular a fashion as Minibar. The Los Angeles-by-way-of-Britain quartet were unceremoniously dropped by Universal after their 2001 debut Road Movies failed to move units, but the band soldiered on with the aptly titled follow-up Fly Below the Radar for indie label Foodchain Records. That record brought the band a smattering of radio airplay and the attention of singer/songwriter Pete Yorn, who brought Minibar on tour to both open the show and serve as his backing band, a relationship that continued through Yorn's most recent spring '07 tour. After finding success despite their label woes, one can hardly blame Minibar for being fed up with the whole scene and branching out on their own. 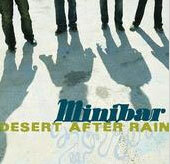 The band's self-produced, self-released third album Desert After Rain makes it clear that Minibar never needed a big label in the first place. The band's bread and butter is American roots rock, an odd choice for a British band, but Simon Petty's rough, raspy vocals (think a less affected Jakob Dylan) are enough to convince even the most jaded listener that that isn't too far a reach. Musically, there's more than a little Wallflowers influence to be found, but Tim Walker's blazing, vaguely twangy lead guitar (think Jay Farrar on early Uncle Tupelo records) moves the band away from the poppier element and toward a more alt-country sound, all with crystal clear production that's a stunner for a self-released album. The album kicks off with "Things I Left Behind," a song that darts back and forth between dark, menacing verses and a shimmering countrified chorus. The following song, however, is the money track: "Crime Scene Ribbon" is a brilliantly constructed, inarguably catchy roots-pop song that, if there was any justice in this world, would be the big radio single of the summer of '07. Petty backs up his vocals with a quickly strummed acoustic guitar while drummer Malcolm Cross keeps the energy up with his lockstep drums and Sid Jordan's bass bobs along, but it's Walker's electrifying lead jumping in and out of the mix that gives "Crime Scene Ribbon" the dynamic punch it takes to remain engrossing for all of its 4:17 runtime. The third song, the stomping country-rock title track, only continues the album's win streak.